Dutch artist, Delft s leading history and genre painter of the 1630s and 1640s. He was the son of a silversmith from Mechelen. 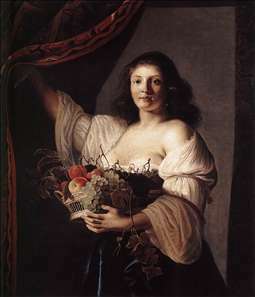 The painter s mother was the sister of the flower painter Jacob Vosmaer. Van Couwenbergh studied with the well-to-do Van Miereveld disciple Jan Dircksz van Nes (d. 1650) and then probably spent some time in Utrecht between 1624 and 1626. 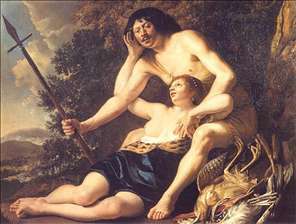 Genre paintings inspired by Gerard van Honthorst and other Utrecht painters date from 1626 onward, but Van Couwenbergh did not join the Delft guild until 1627. in 1630 he married Elisabeth van der Dussen, whose father was a prominent brewer and East India Company officer who also held the civic offices of burgomaster and sheriff in Delft. Whether or not the artist ever went to Italy, as Houbraken claims, is uncertain; no trace of the experience can be found in his work. His style was international insofar as it was inspired by cosmopolitan painters like Rubens and Van Honthorst; this sufficed to bring him a number of enviable commissions at the princely palaces in and around The Hague and in public buildings in the southern part of Holland. In addition to mythological pictures for the palaces at Honselaarsdijk and Rijswijk, Van Couwenbergh painted illusionistic friezes of hunting motifs and military trophies on the piers of the Oranjezaal in the Huis ten Bosch (1650-51). It was probably in connection with this court project that the prosperous painter and his large family moved from Delft to The Hague in 1647-48. Despite a substantial inheritance from his wife, who died in 1653, Van Couwenbergh accumulated debts in the court city. In 1654 he withdrew to Cologne, where he continued to produce history and genre paintings until his death. Van Couwenbergh also painted tapestry cartoons and fashionable family portraits. His command of anatomy and other descriptive qualities does not stand up to close scrutiny and his designs are often formulaic or clumsy. 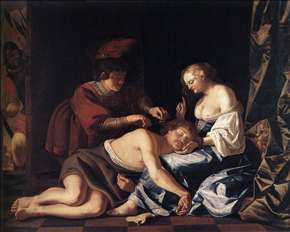 However, he had a flair for broad effects and mild-mannered eroticism, whether in biblical scenes or genre subjects in the light vein of Van Honthorst. 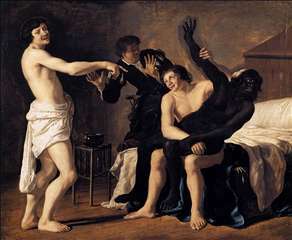 See more details about "Three Young White Men and a Black Woman"
See more details about "Woman with a Basket of Fruit"
See more details about "The Capture of Samson"